Corey Conners survived a 6-for-1 playoff on Monday to qualify for the Valero Texas Open. He won’t have to worry about qualifying for a PGA Tour event for at least the next two years after capping off one of the best stories of the 2018-19 season with a two-shot win on Sunday at TPC San Antonio. Conners also earned a spot in the Masters field. The Ping staffer logged 10 birdies on his way to a final round six-under 66. Conners led the field in strokes gained: approach-the-green for the tournament with Ping’s iBlade irons and a mixed set of Glide 2.0 Stealth and Glide Forged wedges, but it was his PLD Anser 2 putter that was the difference-maker on Sunday. Conners made over 116 feet worth of putts with the blade model while picking up more than three strokes on the field. Conners came to Ping’s putter lab back in December to work on his flatstick and found a suitable option in the Anser 2 head shape, which features tungsten plugs in the bumpers to give it a heavier overall 370-gram head weight, something the former top-ranked amateur prefers. 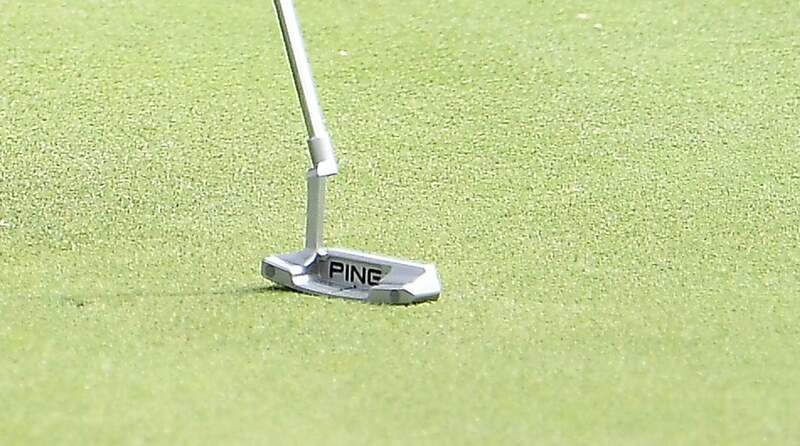 Weight plugs are visible in the bumpers of Corey Conners' Ping PLD Anser 2 putter.